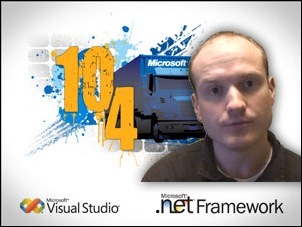 10-4 is a weekly video podcast which gives you a look at what's coming in Visual Studio 2010 and the .NET Framework 4.0. Over and out! For this first episode of 10-4, we’ll look at how to download and use the Virtual PC image of the Visual Studio 2010 September CTP. We’ll give you tips on how to download this massive (7GB+ compressed) VPC, show you how to get past some pesky expiration issues, and get you started with the CTP walkthroughs. Lastly we’ll cover where to get assistance and provide your feedback about this release. In future episodes we’ll dive more deeply into the technical underpinnings of Visual Studio 2010 and the .NET Framework 4.0, but for this first episode we wanted to make sure everybody could get the CTP and follow along at home.